For those of you who don't know, NaNoWriMo stands for the National Novel Writing Month, an event held annually in November where participants are challenged to write 50,000 words of a novel in one month, at a rate of around 1,667 words per day. It is a challenge that, other than its 50,000 word goal, has very few rules or regulations, instead encouraging novelists-to-be to explore themselves through their writing. Technically, you don't even have to write a novel. Many people write fanfiction, autobiographies, non-fiction books, scholarly journals, or even blog posts. The importance of the event is placed on the goal of writing as much as you can, rather than what you write. 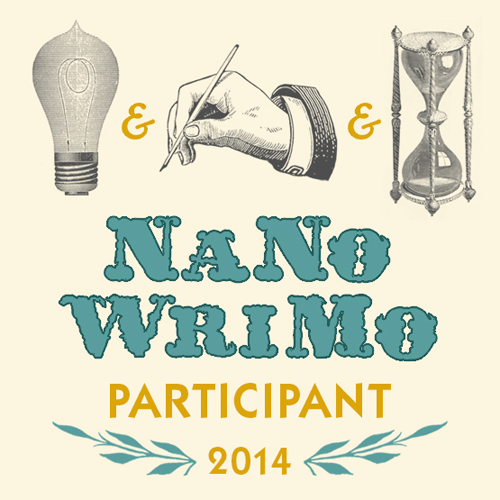 As NaNoWriMo has grown in popularity over the past few years, it has attracted its own share of critics. More than a few people, especially those people serious about getting published or who self-publish, view NaNoWriMo as a kind of amateur hour, when anyone with a word processor will put out what they see as sub-par novels that flood an already dense market. I won't link any specific arguments since I don't want to attract ire on the posters, but a Google search isn't difficult. To be fair to the critics, they do have some points about how saturated the market has become when including NaNoWriMo. I personally have read more than a few interviews with literary agents who acknowledge that the couple months after NaNoWriMo are some of their busiest, with people submitting their unedited novels directly to agents without concern to whether it actually deserves to be published. It is a problem important enough that the kind folks who run NaNoWriMo have begun initiatives to get users to edit and re-edit their own books in the months after the event. However, while I can certainly see the criticism side of NaNoWriMo, I believe that the event is still one of the most important events on the internet. Why? Because, to put it simply, it gets people to do something they probably otherwise never would have done before. Even in the day of easy access to word processors, writing a novel is hard. Sitting down enough times every day to pour your heart and soul onto a page, then doing it often enough to make it into a coherent story is difficult. I should know, as I've participated in NaNoWriMo 4 times, completing a novel every time, and each time it was one of the most difficult activities I've ever done. It is a test of the mind and spirit, to continue on, even if you know that, more than likely, you are doing it for your own benefit. Because, while many people do indeed submit their half-finished messes to literary agents, even more will never let anyone see their novels beside themselves. And that is what is, perhaps, one of the most important points to NaNoWriMo. For the majority of the writers in the event, simply writing the book is enough of a victory in itself. It is a merit, to them, to have written a novel and they don't need further gratification. No publishers, no agents, not even self-publishing. In the internet age, a person's talent is always for sale. Artists, writers, voice actors, comedians, bloggers, and others can make money from their talents in many different ways. Artists all across deviantART and tumblr sell commissions, writers self-publish and commission as well, comedians start Youtube channels with ads, etc. It is harder, today, to find someone who doesn't sell their skill, and instead has a simple hobby that they do just for the fun of it. Now, I am not going to argue that all those people making money from their talents are wrong. But, I will argue that it is something of a lost art to have the ability to just make something without the intention to make money from it or to benefit from it other than to sit back and enjoy you did it. To me, this is one of the big reasons NaNoWriMo is important. While it can, indeed, kickstart the careers of many a hopeful writer (including yours truly), it can just as easily provide a creative outlet to millions of people who just want to write. And, as someone who is both a writer and aspiring educator, that is something beautiful. In a world that seems to increasingly move away from the novel as a primary form of entertainment, the fact that so many people across the world can sit down for one month to write a book for their own enjoyment is amazing. Our society is accused of having low attention spans, but yet millions more adults and teenagers are taking town out of their increasingly-busy days to write an entire book. NaNoWriMo may not create a novelist out of everyone, but that isn't what the purpose of the event is, and the event's critics should take note. NaNoWriMo's greatest strength is its ability to bring together people from diverse backgrounds and locations together in a love of the written word and the desire to try it out for themselves. Even if many of those resulting novels are never seen by anyone but the writer, the event is creating a world of more literate adults passionate about writing and creating worlds of their own. And that, to me, is what makes the event worthy, that even if schools and society struggle to educate people in the finer qualities of literature, events such as this one can pick up the slack and instil a love of literature in this generation and those yet to come.